This beachfront hostel overlooking the Pacific Ocean is a former hotel built in 1921. We have a varied selection of room types, a homely lounge, and a well equipped kitchen and garden courtyard for chilling out or dining out. Add cheerful staff and you have a hostel with character and a warm atmosphere. Sparkling sunny Napier is a city with style surrounded by fine vineyards and looking out to Cape Kidnappers, colonised by the beautiful dynamic gannet seabird. Destroyed by earthquake and fire in 1931 and quickly rebuilt, Napier is now a world recognised Art Deco architectural gem. 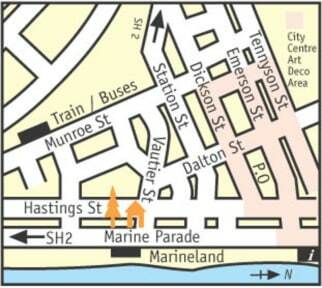 We can help you plan art deco, wine, gannet or sightseeing tours. If you want something a little more adventurous you could try para-sailing, ballooning, windsurfing, kayaking or mountain biking. For the kids we have mini golf, playgrounds just across the road and in nearby Hastings there is Splash Planet water theme park. 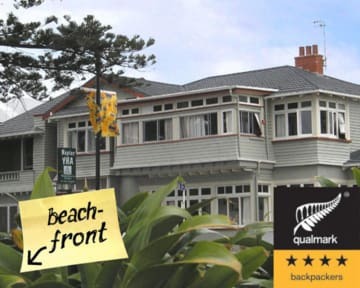 We are situated very close to The National Aquarium and Kiwi House, Hawkes Bay Museum, Ocean Spa (hot salt water pools), and the War Memorial Conference Centre. Napier City Centre, restaurants, cafes, bars, takeaways and supermarkets are all within 5-10 minutes walk and the Intercity/Newmans bus stop is close by. We look forward to seeing you in this relaxing sunny seaside town.